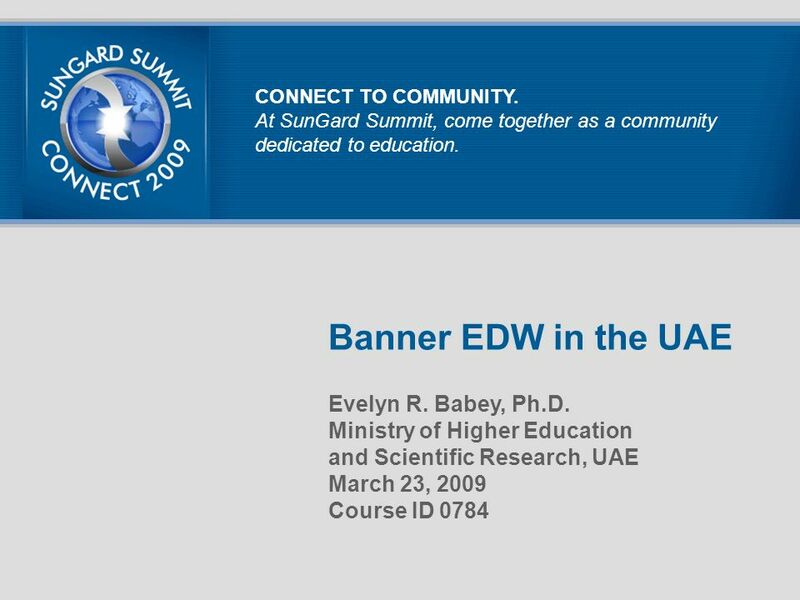 Banner EDW in the UAE Evelyn R. Babey, Ph.D. Ministry of Higher Education and Scientific Research, UAE March 23, 2009 Course ID 0784 CONNECT TO COMMUNITY. 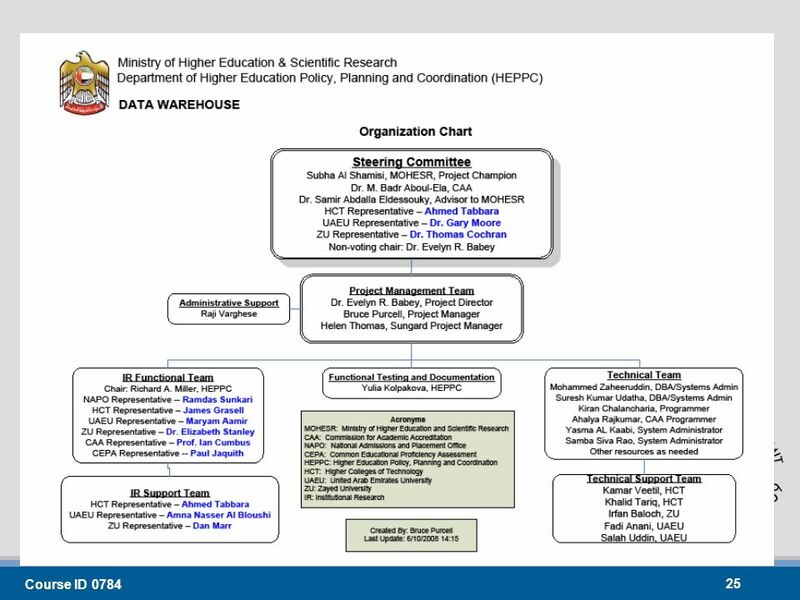 1 Banner EDW in the UAE Evelyn R. Babey, Ph.D. Ministry of Higher Education and Scientific Research, UAE March 23, 2009 Course ID 0784 CONNECT TO COMMUNITY. 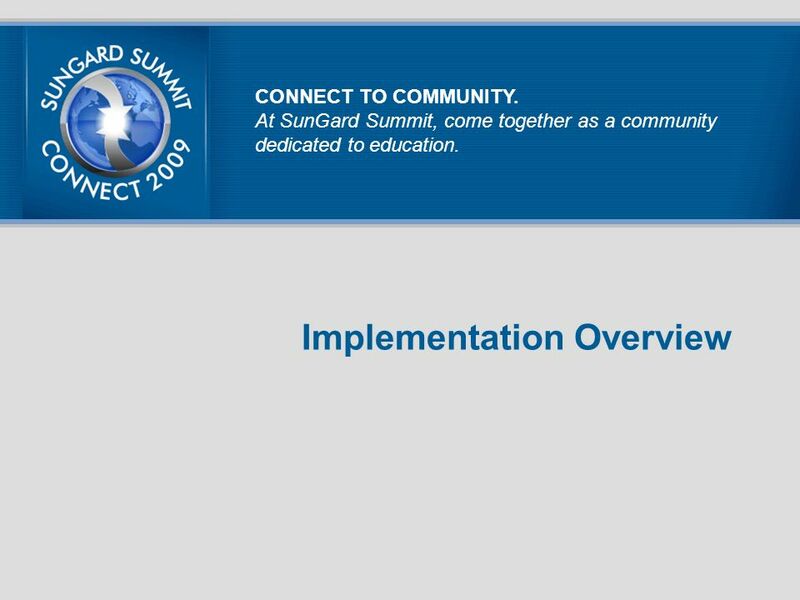 At SunGard Summit, come together as a community dedicated to education. 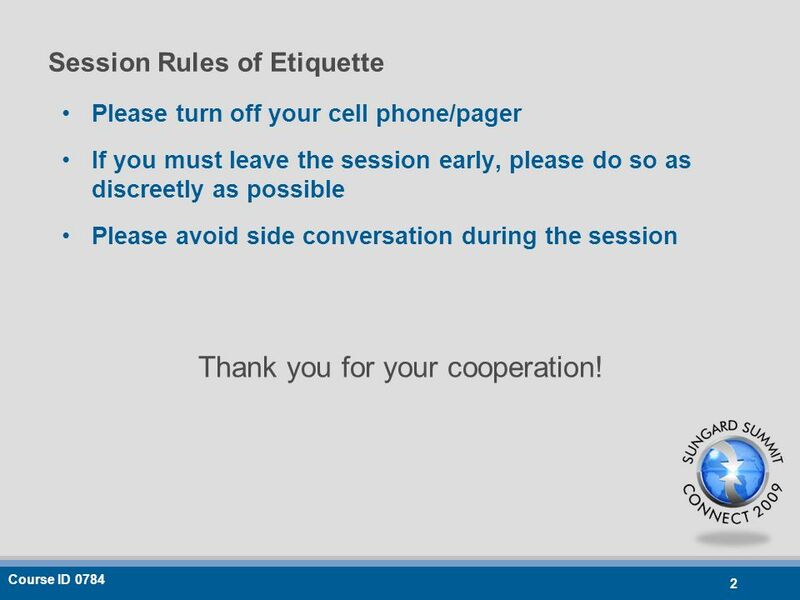 2 Course ID 0784 2 Session Rules of Etiquette Please turn off your cell phone/pager If you must leave the session early, please do so as discreetly as possible Please avoid side conversation during the session Thank you for your cooperation! 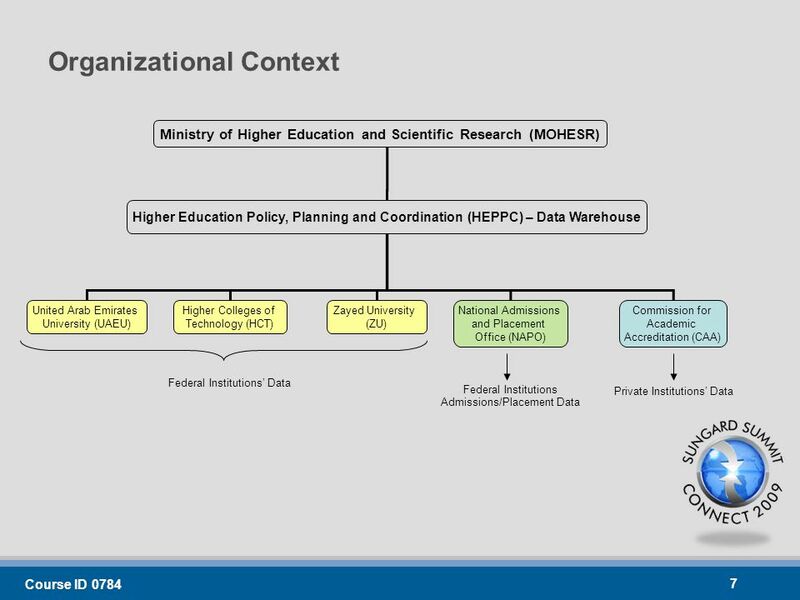 6 Organizational Context CONNECT TO COMMUNITY. At SunGard Summit, come together as a community dedicated to education. 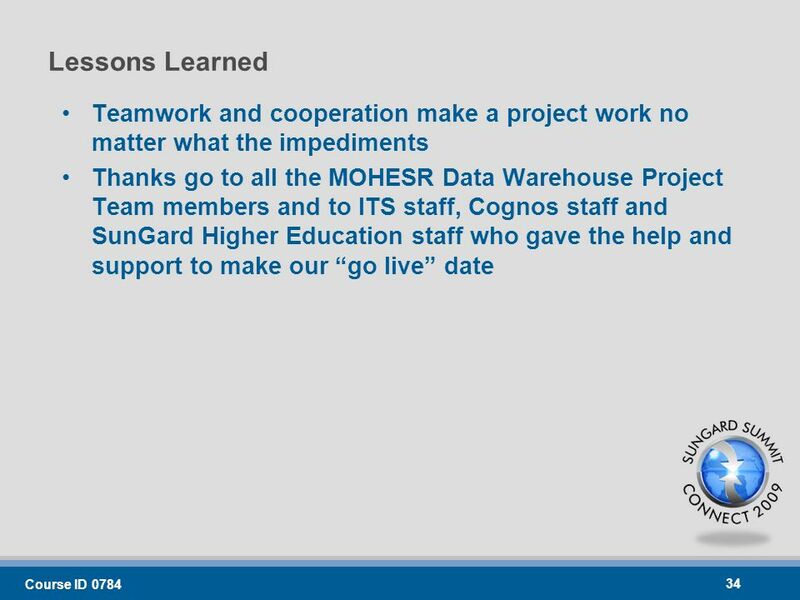 8 History of the MOHESR Higher Education Data Warehouse CONNECT TO COMMUNITY. At SunGard Summit, come together as a community dedicated to education. 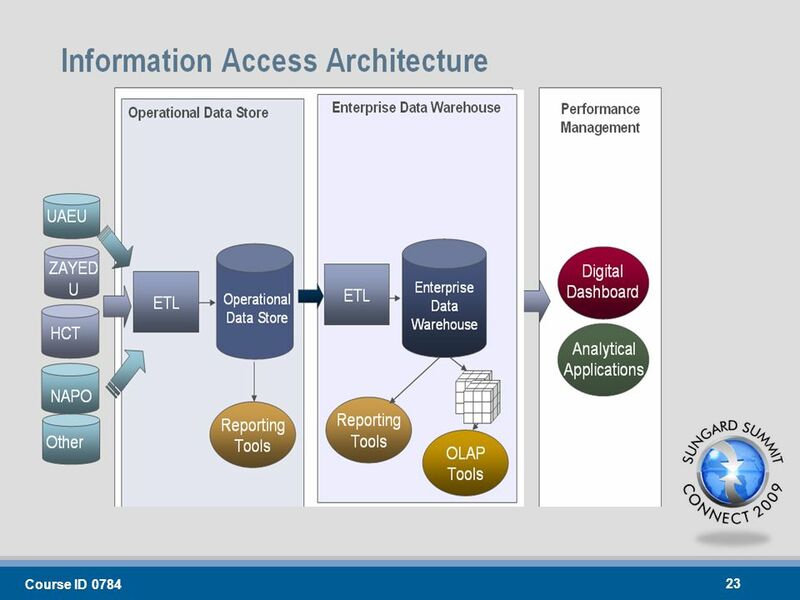 12 Need for Performance Management Analytics CONNECT TO COMMUNITY. At SunGard Summit, come together as a community dedicated to education. 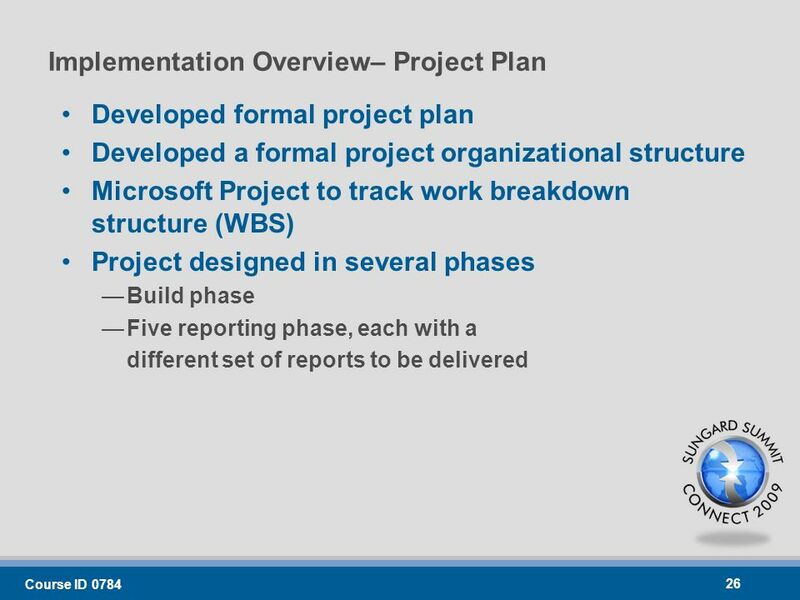 14 Project Goal CONNECT TO COMMUNITY. 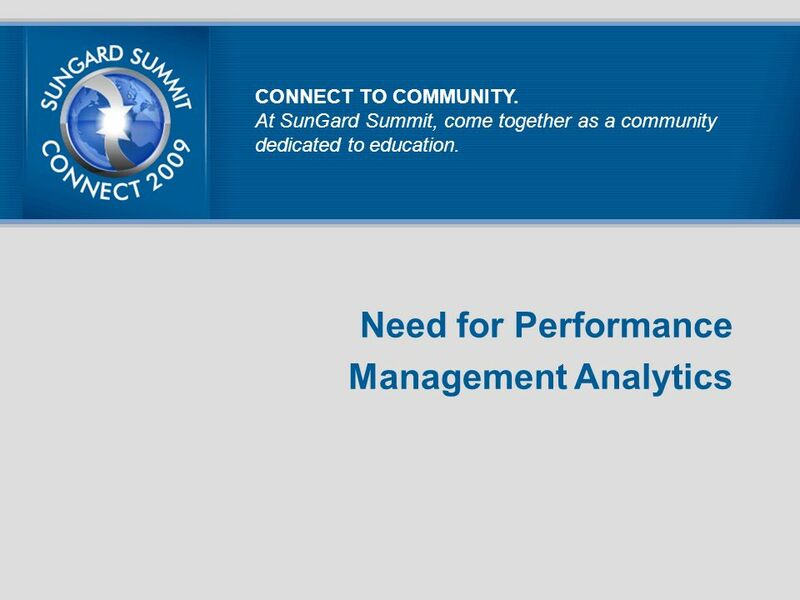 At SunGard Summit, come together as a community dedicated to education. 16 Vendor Selection CONNECT TO COMMUNITY. 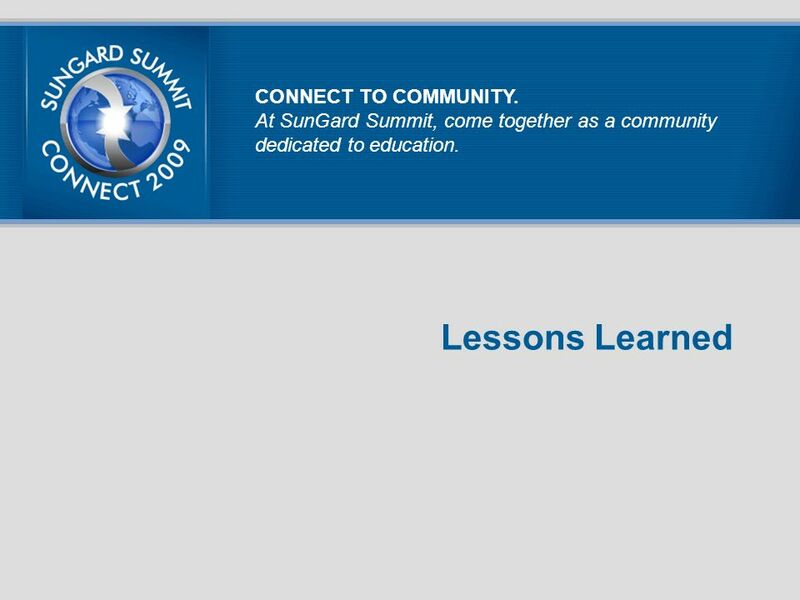 At SunGard Summit, come together as a community dedicated to education. 21 Uniqueness of Implementation CONNECT TO COMMUNITY. At SunGard Summit, come together as a community dedicated to education. 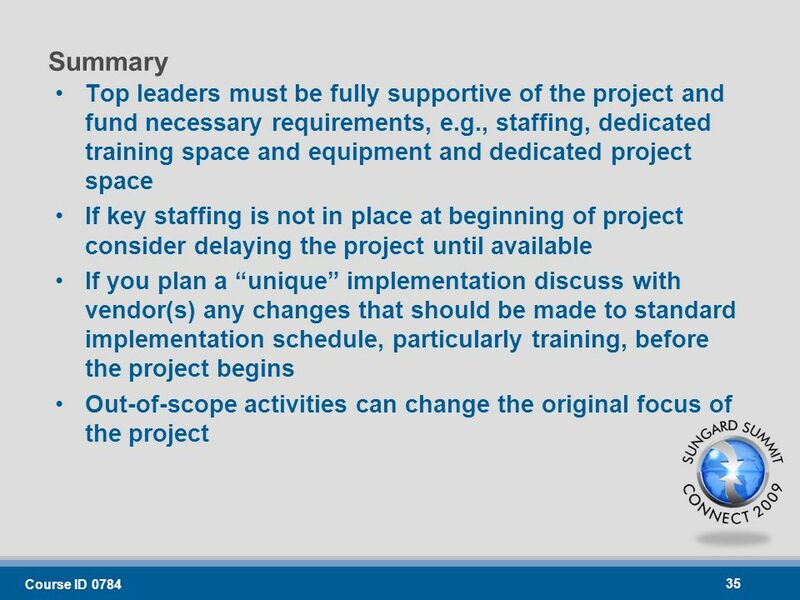 24 Implementation Overview CONNECT TO COMMUNITY. At SunGard Summit, come together as a community dedicated to education. 32 Lessons Learned CONNECT TO COMMUNITY. 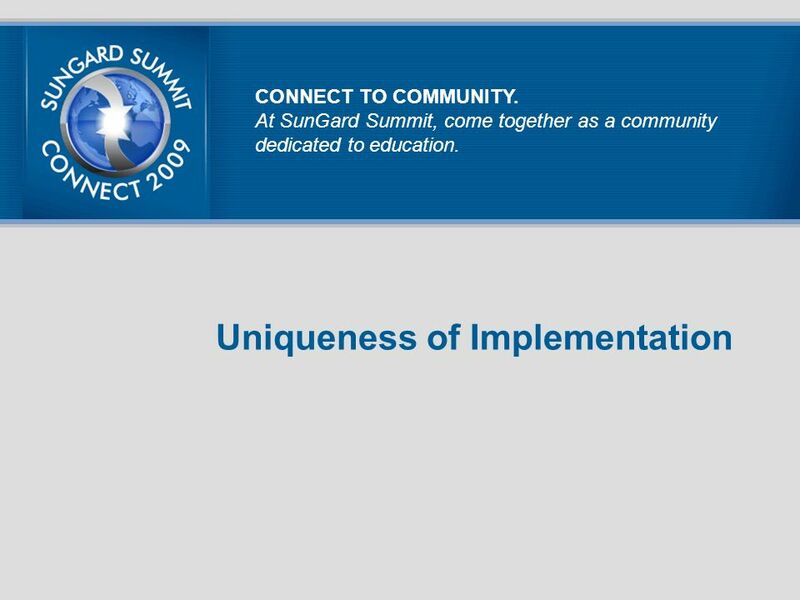 At SunGard Summit, come together as a community dedicated to education. 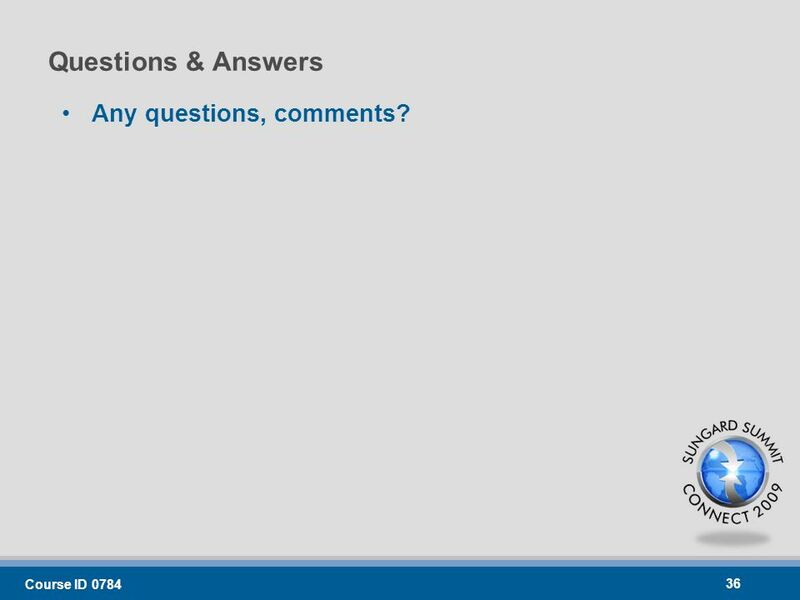 36 Course ID 0784 36 Questions & Answers Any questions, comments? 37 Course ID 0784 37 Shukran! 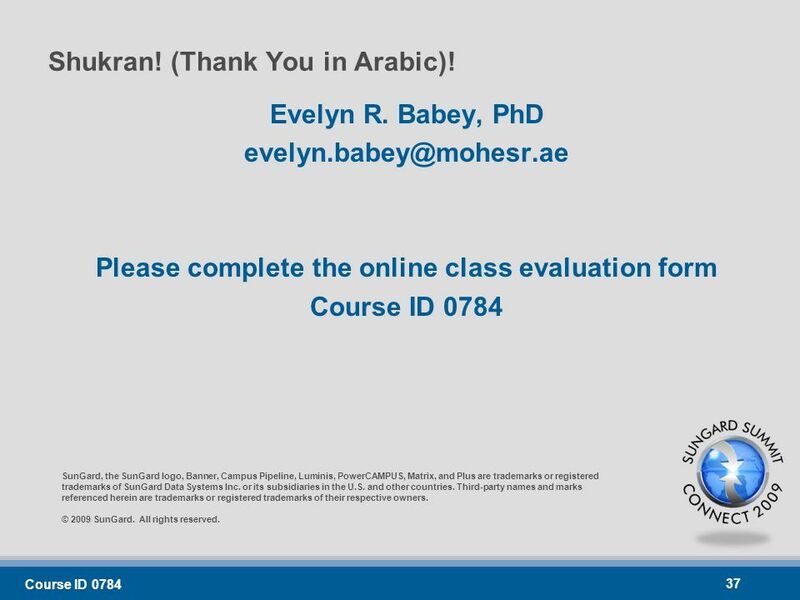 (Thank You in Arabic)! 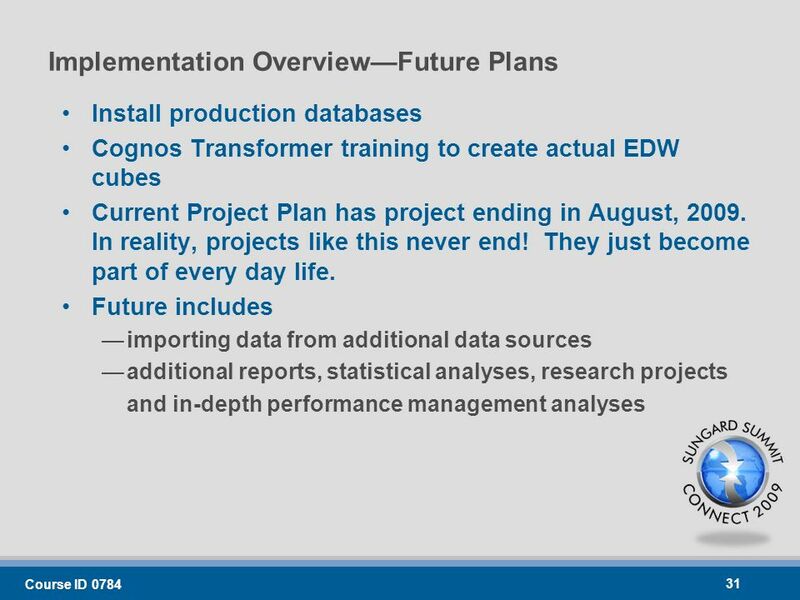 Evelyn R. Babey, PhD evelyn.babey@mohesr.ae Please complete the online class evaluation form Course ID 0784 SunGard, the SunGard logo, Banner, Campus Pipeline, Luminis, PowerCAMPUS, Matrix, and Plus are trademarks or registered trademarks of SunGard Data Systems Inc. or its subsidiaries in the U.S. and other countries. 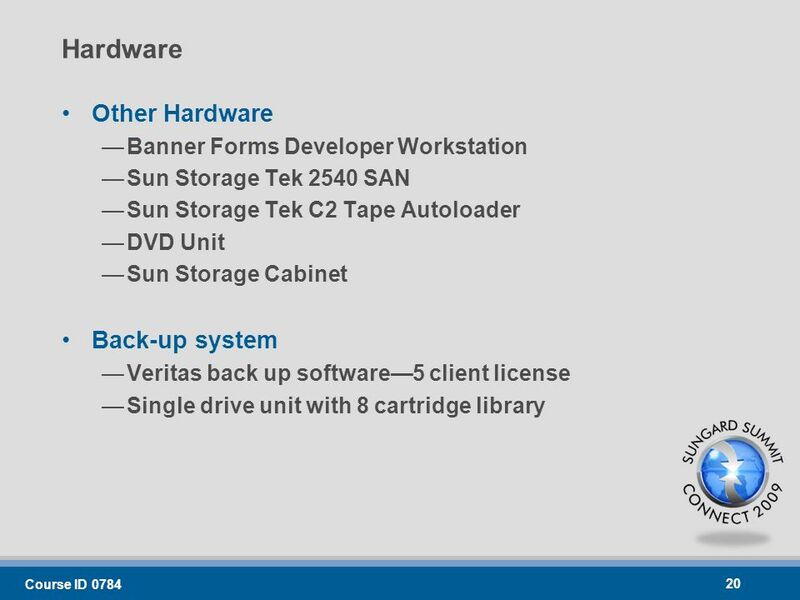 Third-party names and marks referenced herein are trademarks or registered trademarks of their respective owners. 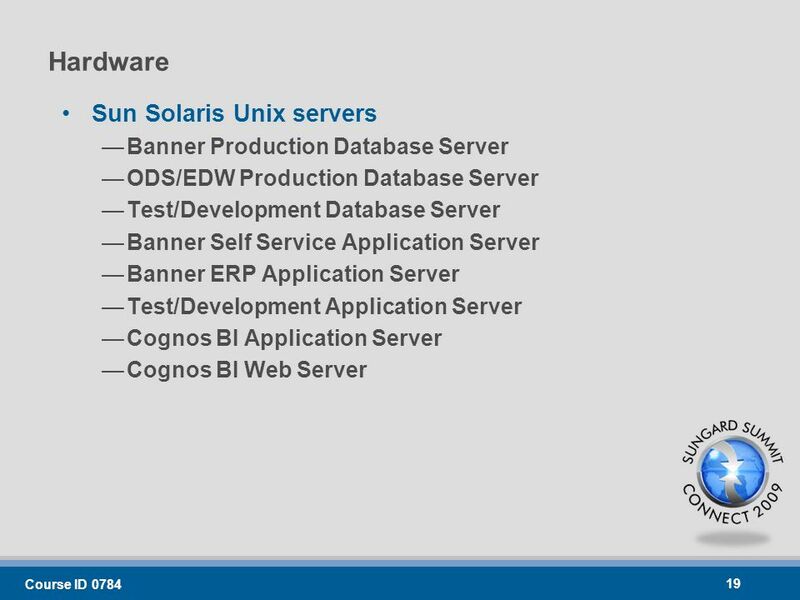 © 2009 SunGard. All rights reserved. 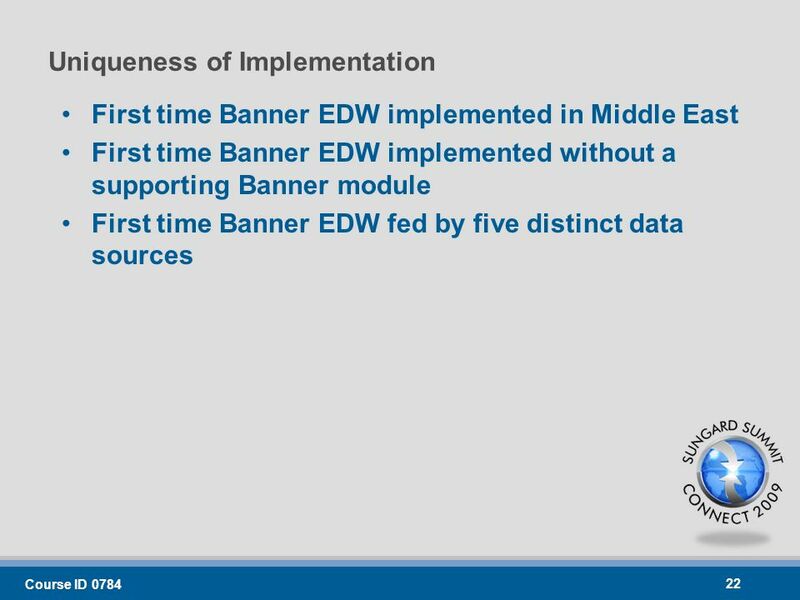 Download ppt "Banner EDW in the UAE Evelyn R. Babey, Ph.D. Ministry of Higher Education and Scientific Research, UAE March 23, 2009 Course ID 0784 CONNECT TO COMMUNITY." 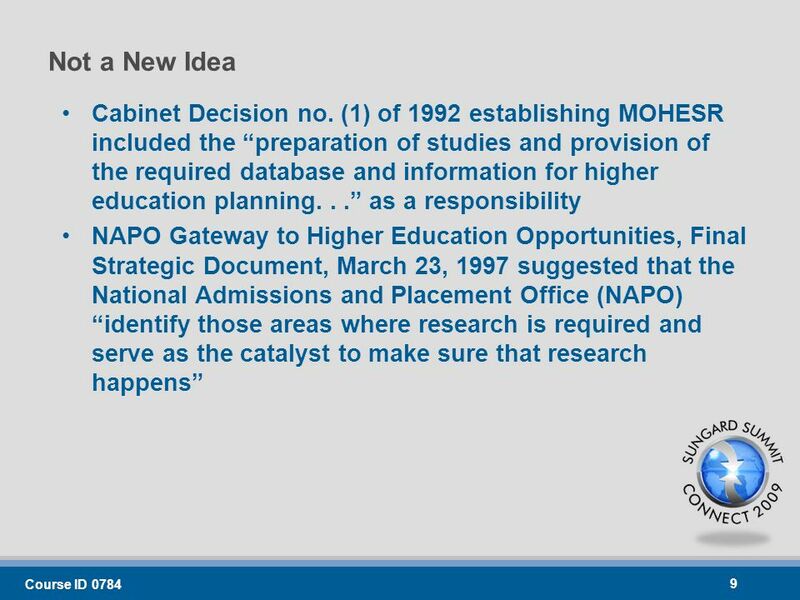 MS Access Reporting (BOF) Evaluation Code 303 Bruce Knox University of Arkansas Cooperative Extension Service Bruce Loving University of North Carolina. 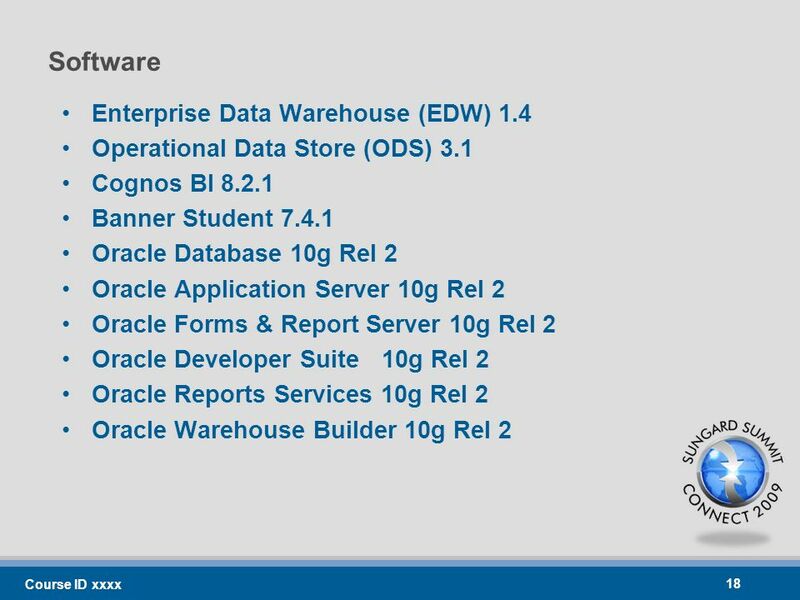 10 th Anniversary Oracle Database and Application Server Packs. 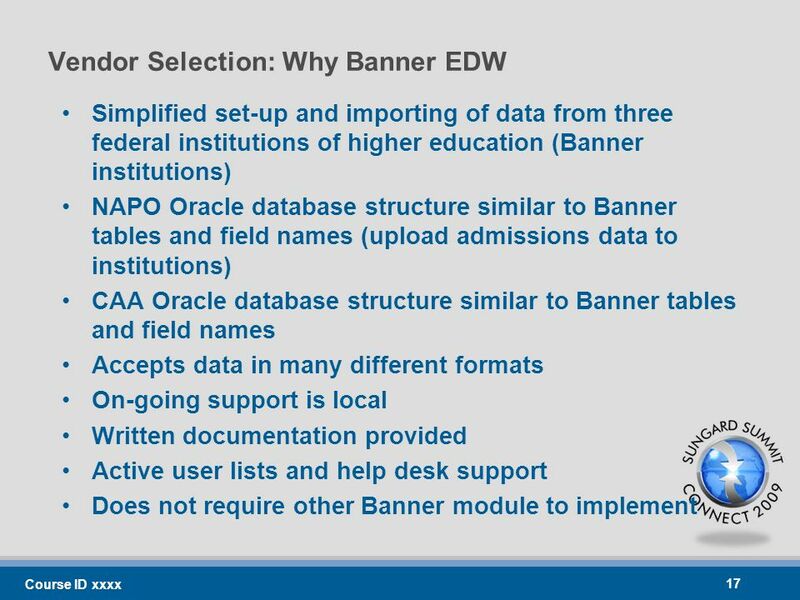 Pennsylvania BANNER Users Group 2006 NCATE Assessments John Tabor University of Scranton. Pennsylvania Banner Users Group 2008 Fall Conference IUP Banner Server Environment Jeff Montgomery. 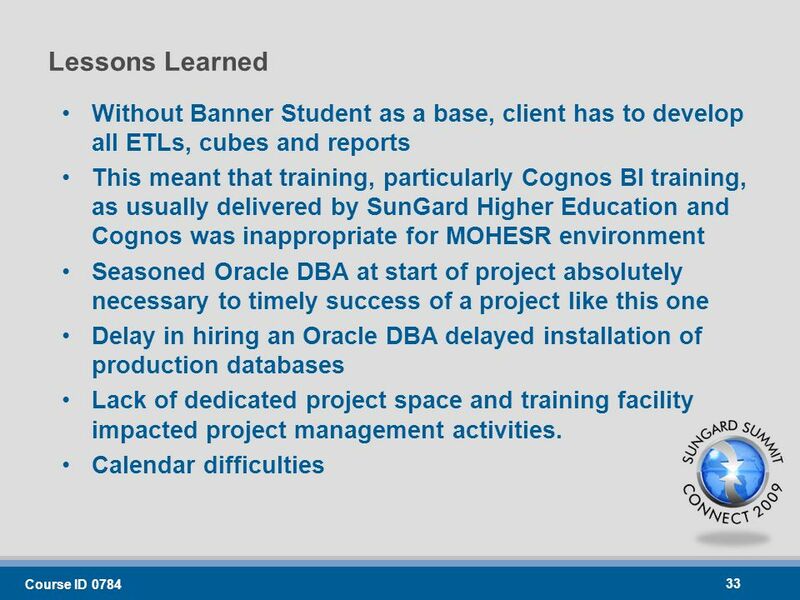 Pennsylvania BANNER Users Group 2007 Duquesne University Data warehouse Greg Jerry Jill Spitznagel Chad Painter. Pennsylvania BANNER Users Group 2007 Structuring a reporting environment for success. 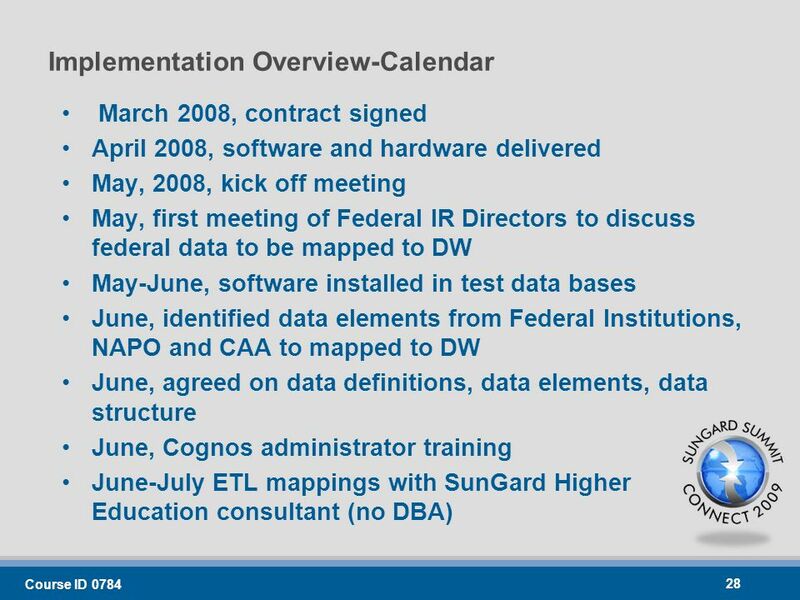 Pennsylvania BANNER Users Group 2007 Successfully Implementing a Decentralized Admissions Solution. 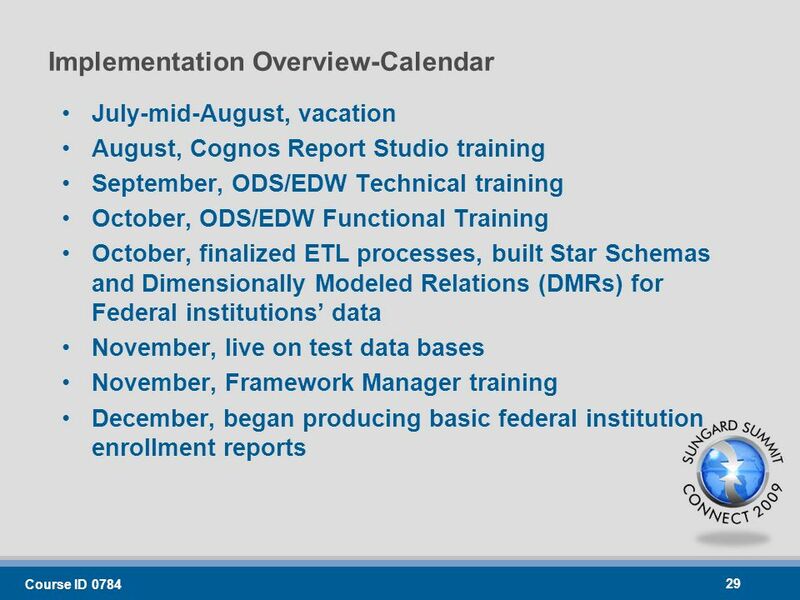 10 th Anniversary Implementing a Dynamic Management Reporting Environment. 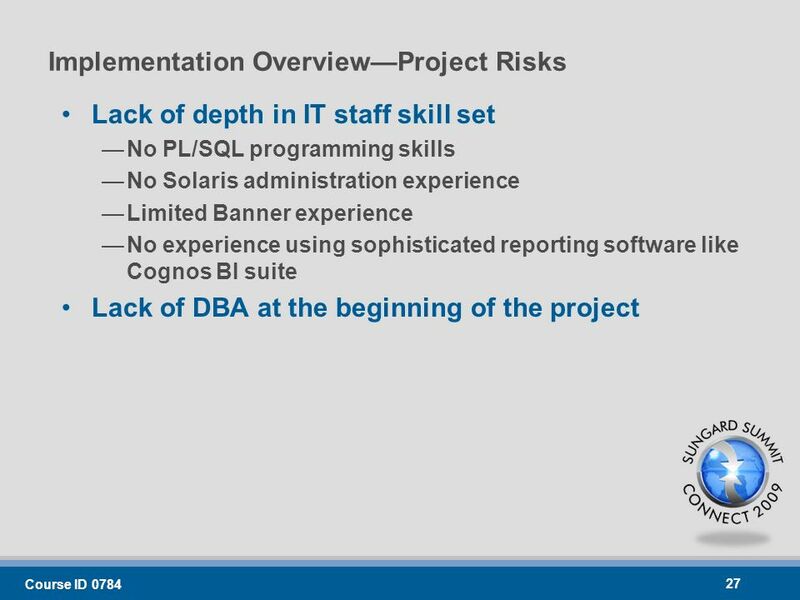 Pennsylvania BANNER Users Group 2006 Integrate Your Decision Support with Cognos 8. Pennsylvania Banner Users Group 2008 Fall Conference Banner 8.0 Upgrade Banner 8.1 Requirements and Tips. 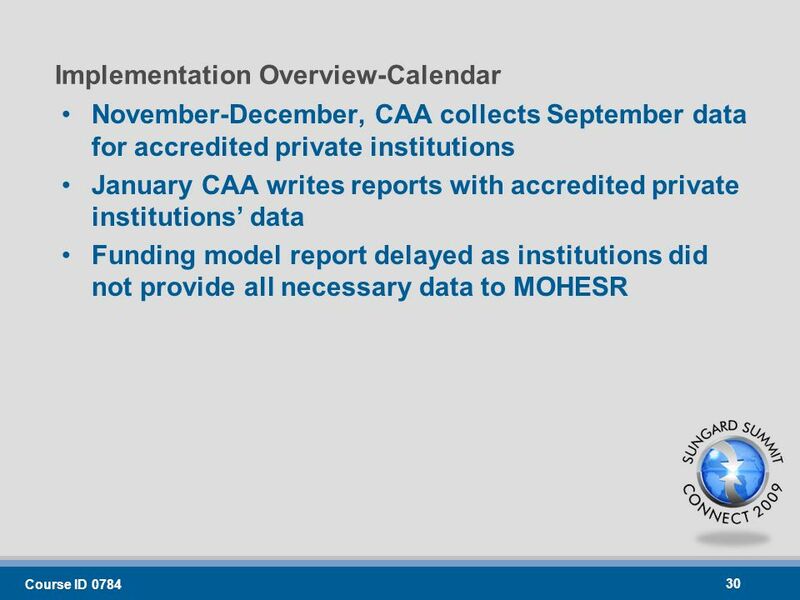 Pennsylvania Banner Users Group 2008 Fall Conference EMUR (Enrollment Management Reporting) Portal.